As a B2B marketer, the process of nurturing and generating new leads is always tricky business. Chasing high quality and relevant leads requires a considerable amount of time, energy and resources to be invested into email marketing campaigns, social media management and educational content such as blogs, whitepapers and eBooks. 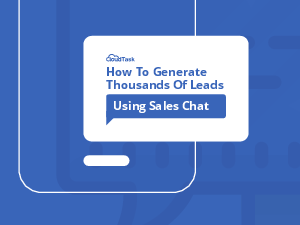 While live chat support has been around for about a decade, only in recent years and especially in the age of the smartphone, are B2B companies capitalizing on it as a channel to generate and nurture leads.